Jamaica’s national championship has begun. 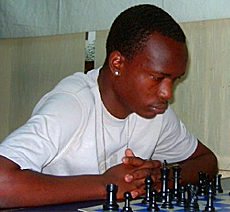 Defending champion Damion Davy sets forth to defend his national title as ten hopefuls pawn off in the national chess fete. This year’s version is without a number of marquee players. In addition, last year’s co-champion Andrew Mellace is in Barbados participating in the Heroes Day Cup. He unsuccessfully lobbied to have his games postponed until his return. “I really wanted to play in the nationals. I really want to defend my title. Who does not want to defend their title?” he was quoted as saying in a Gleaner interview. This occurrence has somewhat dampened the anticipation and has created a bit of a controversy on the island, but the competing players will be prepared to fight no less. Apart from Davy, National Master and Olympian Russel Porter will headline a list of contenders including a number of National Masters and some rather new entrants in the ten-player format. Email feedback, send in your games or upcoming tournaments to yourchessmate@yahoo.com and join the Facebook page “ChessMate”. Claire Clarke is a former Women’s National Champion, three-time Jamaica Women’s team Chess Olympiad representative, trained journalist and editor. Defending champion FCM Damion Davy and Walter Williams are the early front-runners on 2 points after the first 2 rounds. In round 1 the top seed Davy saw off 2nd seed FCM Russell Porter. In the battle of the two “Peters”, Myers sacrificed material after material to net Thomas’ king. Daren Wisdom took a gamble which didn’t pay off against Brandon Wisdom as he was duly punished. Ian Wilkinson had Andre Soares on the ropes but missed the winning variation which enabled Soares to weasel out and grind out a win. The tie of the round was definitely Walter Williams defeat of 3rd seed Malaku Lorne who is one of the tournament favourites. Williams showed great maturity in grinding out the result and this can only spur him on to greater things. Round 2 saw Lorne getting the better of Thomas in what was a crucial encounter between the 2 if they wanted to keep hopes of winning the championship alive. Walter Williams continued his fairytale start by besting Presi Wilkinson in a sharp Sicilain Najdorf. Brandon Wilson and Andre Soares battled to a draw, the only 1 so far of this event. Daren Wisdom got his first point by grinding out a result against 2nd seed FCM Russell Porter leaving Porter’s hopes of winning the event very dim. The defending champion FCM Davy turned back Peter Myers to maintain his perfect score. The championship continues tomorrow, April 28 at the Norman Manley Law School at 1 p.m. Round 4 takes place at Christar Villas, on Wednesday May 1st at 6 p.m. 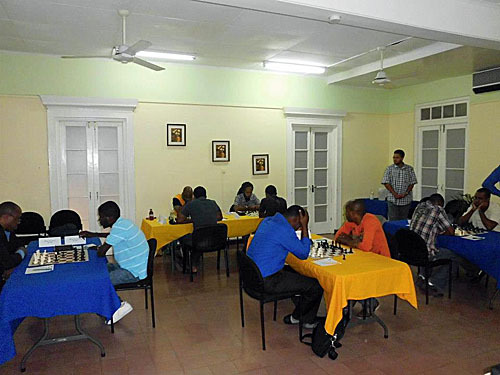 Round 5 will at Liguane Club on May 3rd at 6 p.m. Rounds 6,7,8 and 9 will take place at the Norman Manley Law School on May 4, 5, 11 and 12th respectively. Visit http://www.chess-results.com/tnr98991.aspx?lan=1 to obtain the results as the round finishes and to download the pgn of the games. Also, you may visit our facebook page https://www.facebook.com/ChessJAMAICA where you will find profiles on all the players as well as being able to engage other chessplayers in discussion. 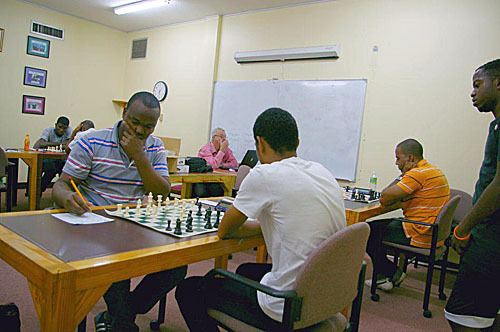 Fide Candidate Master Damion Davy (3/3) edged into clear first place at the end of the 3rd round which was held at the Norman Manley Law School on Sunday. In 2nd place is Walter Williams (2.5/3), 3rd place is jointly held by Malaku Lorne, Brandon Wilson, Daren Wisdom and Andre Soares all on 2/3. In 7th place we have Peter Myers (1/3), 8th Russell Porter (0.5/3) and joint 9th Peter Thomas and Ian Wilkinson (0/3). Davy dispatched his fellow “Group” member Peter Thomas who is yet to score a point in the last round quite easily to maintain his perfect score. Walter Williams and Brandon Wilson battled long and hard but neither could get the better of the other in an enthralling game which ended in a draw. Malaku Lorne punished Ian Wilkinson for his early inaccuracies swiftly, Daren Wisdom rode his luck against Peter Myers before getting out of jail and taking the whole point and Andre Soares game against Russell Porter ended in a draw as Russell Porter forced perpetual check wit Soares attempting to hunt down Porter’s king. The Championship continues tomorrow at Christar Villa, on Hope Road commencing at 6 p.m. with the highlight of the round being FIDE Candidate Master Damion Davy vs Daren Wisdom. Bo.No.Rtg Name Name Rtg No. Tournament leader Damion Davy continues his onslaught against upstart Walter Williams. Photo by Mark Bowen.